Chad Ryan | The Journal Gazette Members of local law enforcement and fire departments stand at attention as the honor guard salutes the funeral procession for local activist Linda Vandeveer on Monday at the Law Enforcement/Firefighters Memorial on Wells Street. 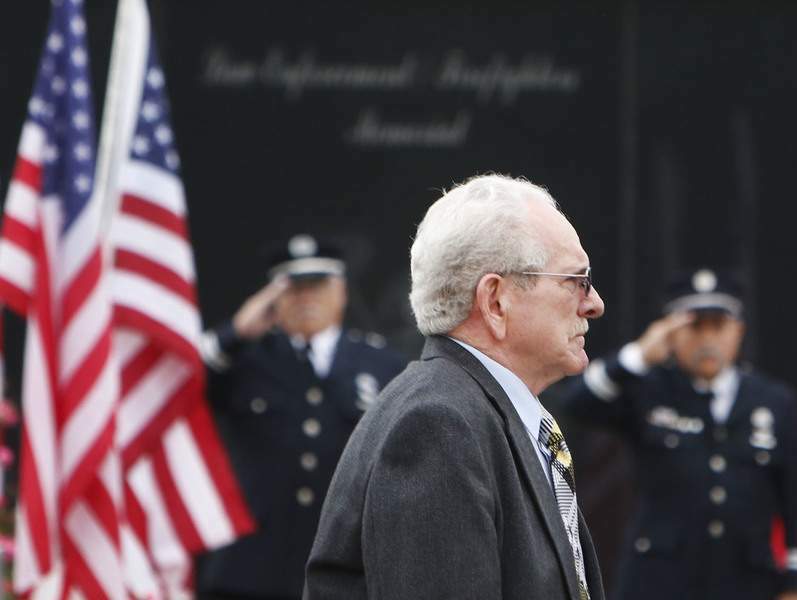 Vandeveer and her husband Jerry worked with local law enforcement clean up their neighborhood of crime and drug houses and helped build the memorial, which pays tribute to police and firefighters who lost their lives in the line of duty. 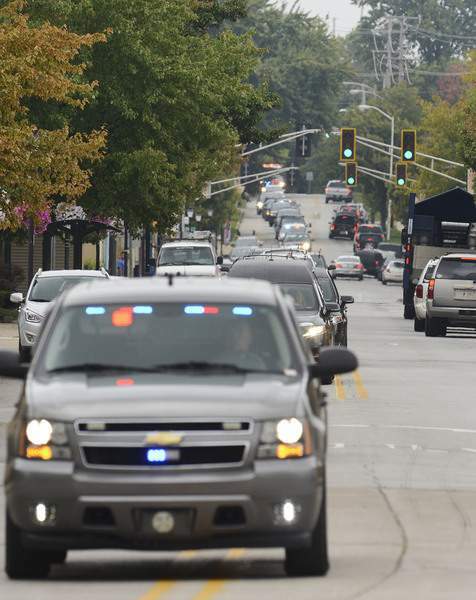 Chad Ryan | The Journal Gazette The funeral processional for Linda Vandeveer stretches down Wells Street as numerous family members, friends, police officers, firefighters and local officials make their way to a stop at the Law Enforcement/Firefighters Memorial Vandeveer and her husband, Jerry, helped build. 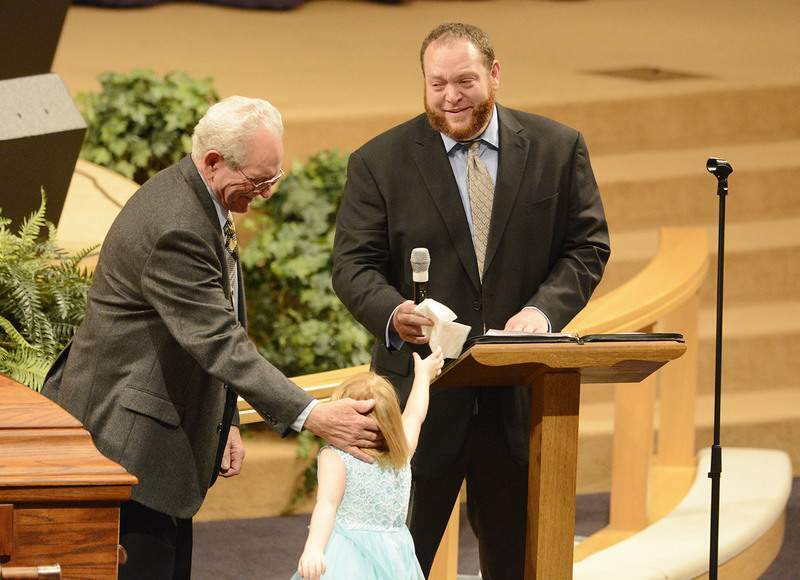 Chad Ryan | The Journal Gazette Gerald Vandeveer, right, smiles as his daughter hands him a tissue during an emoitonal moment as he delivers his comments about his mother, Linda Vandeveer, during her funeral services on Monday at First Assembly of God church on Washington Center Road. Vandeveer and her husband Jerry, left, worked with local law enforcement clean up their neighborhood of crime and drug houses and helped build the Law Enforcement/Firefighters Memorial on Wells Street. 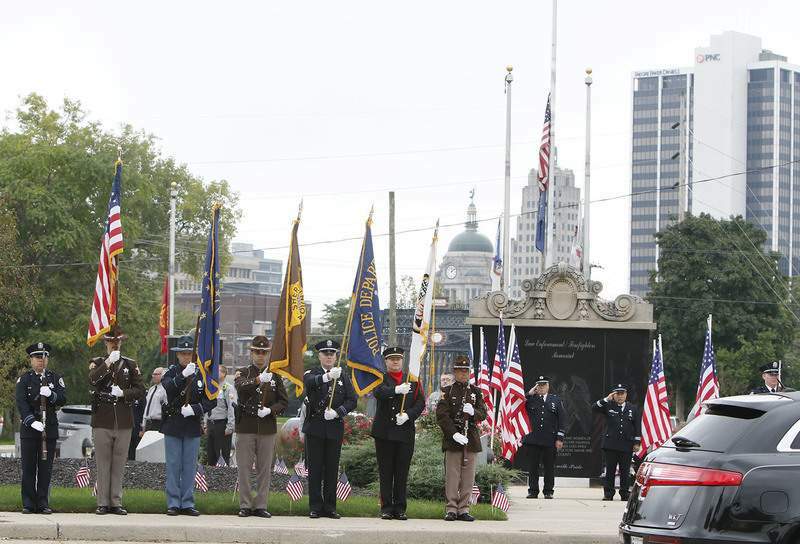 Chad Ryan | The Journal Gazette Members of the Fort Wayne fire and police departments stand and salute as Jerry Vandeveer and his family make a stop at the Law Enforcement/Firefighters Memorial on Wells Street Monday during the funeral procession for Vandeveer's wife, Linda, who lost her battle with cancer on Sept. 29. The Vandeveers worked with local law enforcement to clean up their neighborhood of crime and drug houses and helped build the memorial, which pays tribute to local police officers and firefighters who have lost their lives in the line of duty. 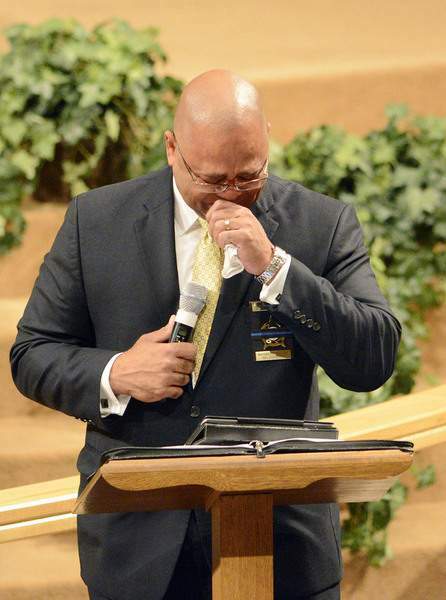 Chad Ryan | The Journal Gazette Fort Wayne Fraternal Order of Police President Mitchell McKinney gets emotional as he talks about his friend Linda Vandeveer during her funeral services on Monday at First Assembly of God church on Washington Center Road. Numerous family members, friends, police officers, firefighters and local officials said their goodbyes to the community activist after she lost her battle with cancer on September 29. Vandeveer and her husband Jerry worked with local law enforcement clean up their neighborhood of crime and drug houses and helped build the Law Enforcement/Firefighters Memorial on Wells Street. 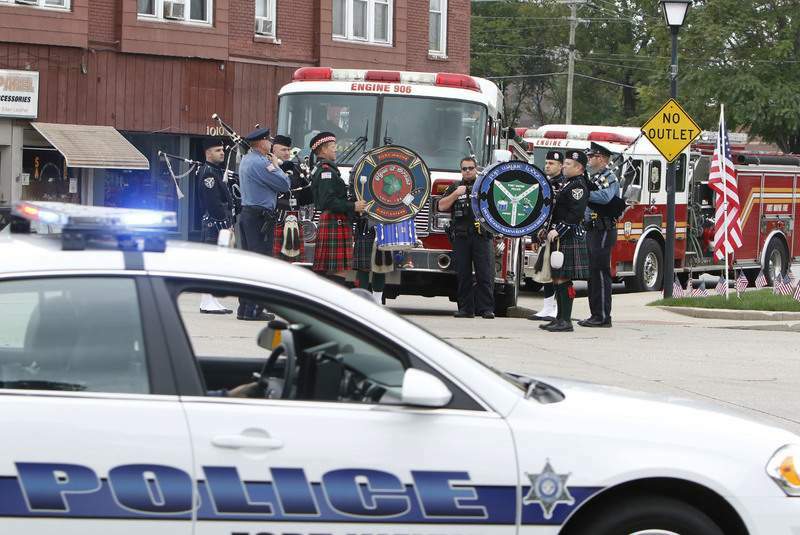 Chad Ryan | The Journal Gazette Members of the Fort Wayne Firefighters and Patrolmen's Benevolance Association Pipes and Drums group play "Amazing Grace" as the funeral procession for community activist Linda Vandeveer makes a stop at the Law Enforcement/Firefighters Memorial on Wells Street during her funeral on Monday. Vandeveer and her husband, Jerry, worked with local law enforcement clean up their neighborhood of crime and drug houses and helped build the memorial, which pays tribute to local police and firefighters who lost their lives in the line of duty. 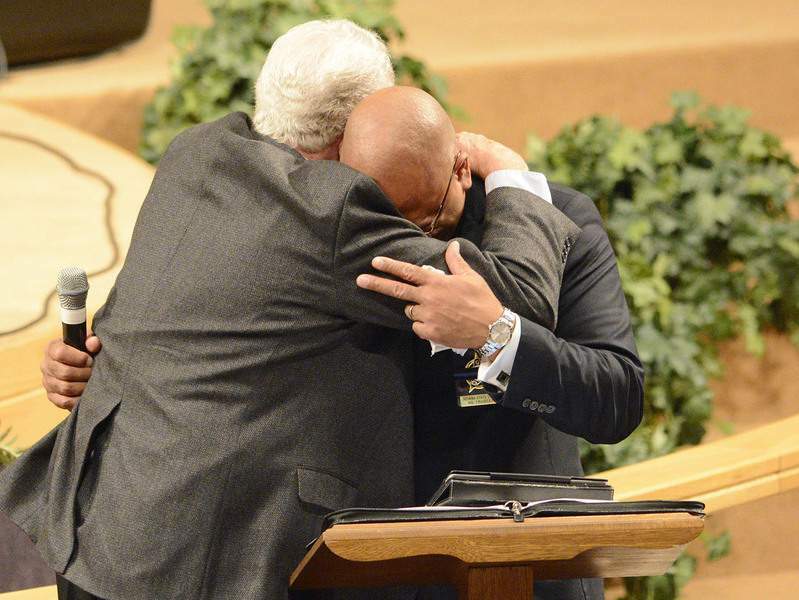 Chad Ryan | The Journal Gazette Jerry Vandeveer, left, hugs Fort Wayne Fraternal Order of Police President Mitchell McKinney during an emotional moment as McKinney delivers his comments about his friend Linda Vandeveer during her funeral services on Monday at First Assembly of God church on Washington Center Road. Numerous family members, friends, police officers, firefighters and local officials said their goodbyes to the community activist after she lost her battle with cancer on September 29. Vandeveer and her husband Jerry worked with local law enforcement clean up their neighborhood of crime and drug houses and helped build the Law Enforcement/Firefighters Memorial on Wells Street. 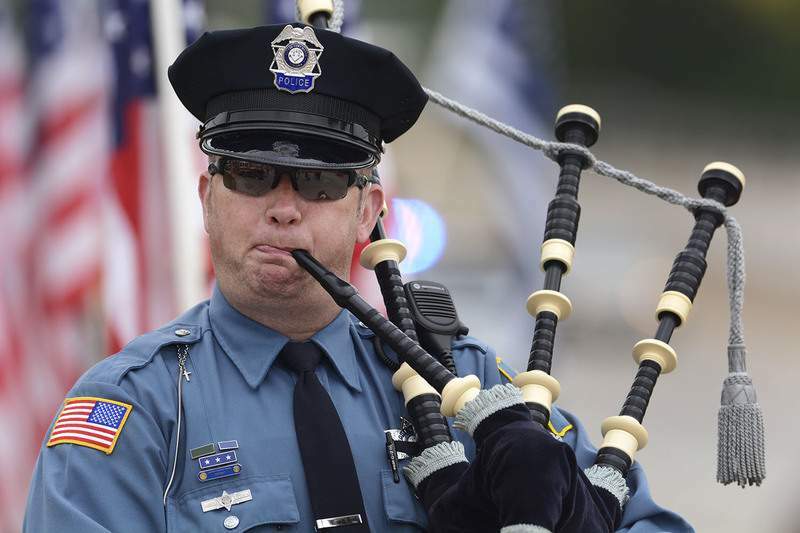 Chad Ryan | The Journal Gazette Fort Wayne Police Officer Jonathan Cutler plays his bagpipes as the funeral processional for Linda Vandeveer makes its way to the Law Enforcement/Firefighters Memorial on Wells Street on Monday to make a stop at the memorial she and her husband, Jerry, helped build. Numerous family members, friends, police officers, firefighters and local officials said their goodbyes to the community activist during her funeral services at First Assembly of God church on Washington Center Road.